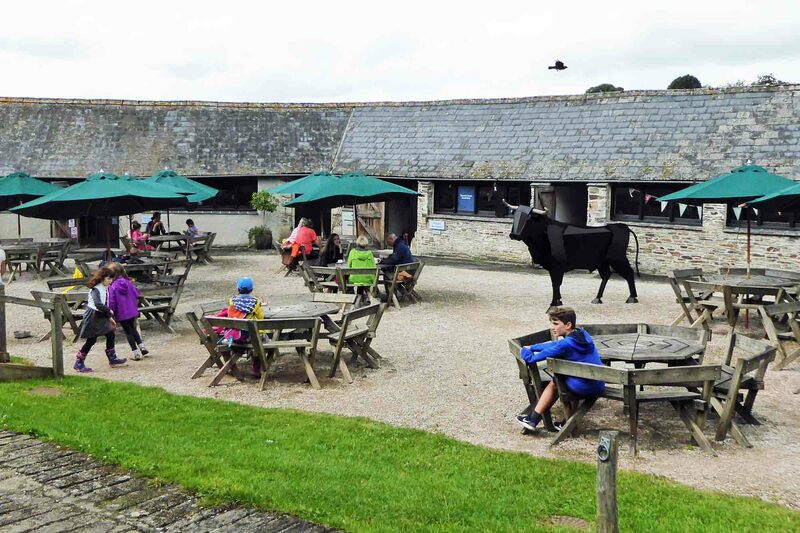 The National Trust provided us with much to appreciate during our recent short break in Devon and Cornwall – from Sir Francis Drake at Buckland Abbey to Sir Richard Acland at Killerton, and from landscaped gardens and parkland at Montacute House to the small intimate gardens at Tintinhull. The National Trust is well represented in the Devon and Somerset area, with stewardship of about 50 sites, and English Heritage has a further 23 sites. My wife and I enjoy visiting heritage properties, but were spoilt for choice and had difficulty in deciding between these many places. English Heritage certainly has some fascinating properties in Devon and Somerset, with Dartmouth Castle and Muchelney Abbey being particularly notable. However most of their properties in the area are ruined castles and abbeys, or prehistoric locations. 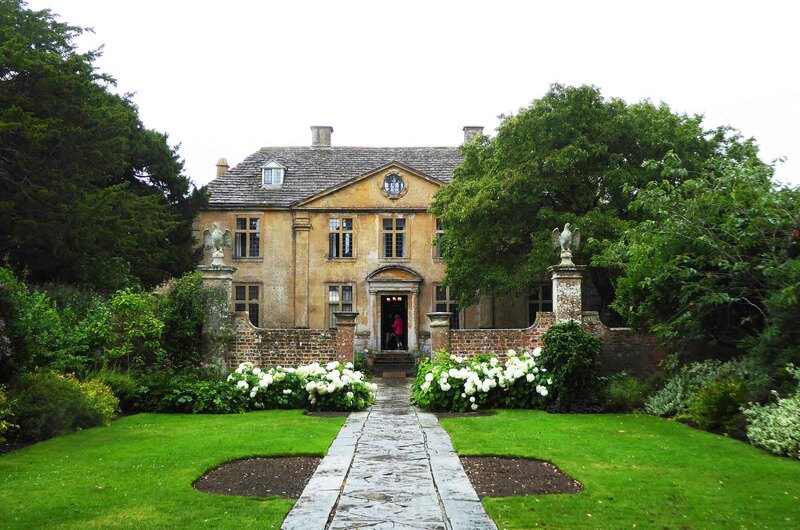 Very well worth visiting, but with showery weather in prospect, we decided that some of the fine houses and gardens managed by the National Trust, made better sense. 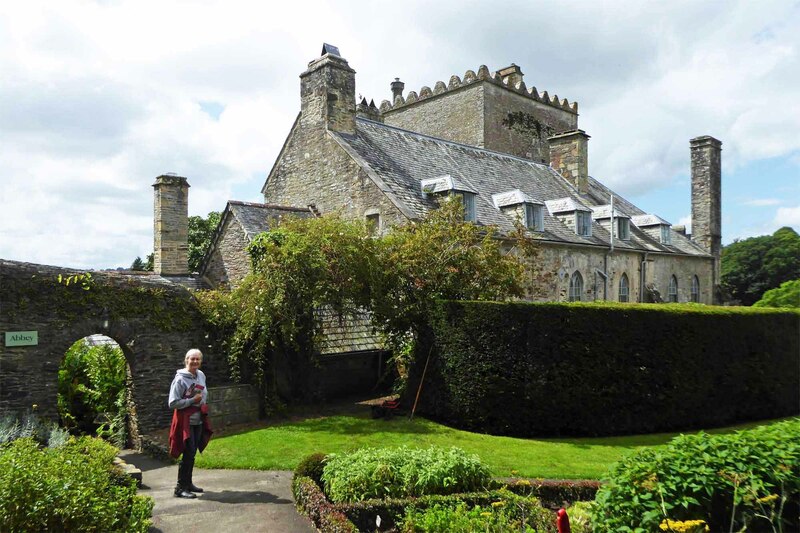 And that proved to be a good strategy – viewing the houses when raining and wandering through the gardens and parkland during the rather limited sunny spells. A good way to spend an English summer! Buckland Abbey is just ten miles from Plymouth Hoe and therefore was very convenient for England’s favourite pirate, Sir Francis Drake, to set up home there in 1581. The abbey was established by the Cistercians in 1274, but fell foul of Henry VIII’s dissolution of the monasteries in 1541 and was converted to a home by Sir Richard Grenville. Although the building itself is not very imposing externally, the interior contains a well organised exhibition of Drake’s life and times. Even his famous drum is on display. I certainly learnt a lot about this historic character and about life aboard a 16th Century galleon. 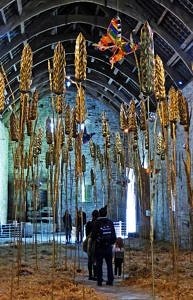 Special exhibitions are arranged from time to time both within the house and the nearby Great Barn. When we visited, work of the artist Andrew Logan was being displayed – very impressive, particularly the massive golden wheat stalks arranged around the Great Barn. There are some pleasant walks through the gardens (kitchen, Cider House and Elizabethan) and around the estate. The Ox Yard Restaurant is a great place for refreshments. The large sun umbrellas over the tables proved very useful when a sudden shower descended on us. 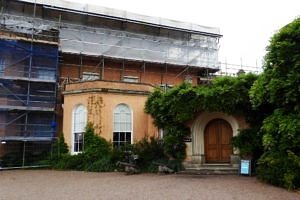 If Buckland Abbey can be said to provide an interesting insight into the mid-16th Century, then Killerton, seven miles from Exeter, provides a similar insight into the mid-20th Century. Much in the house relates to the intriguing life of Sir Richard Acland, a Liberal and then socialist politician, whose deeds matched his words. 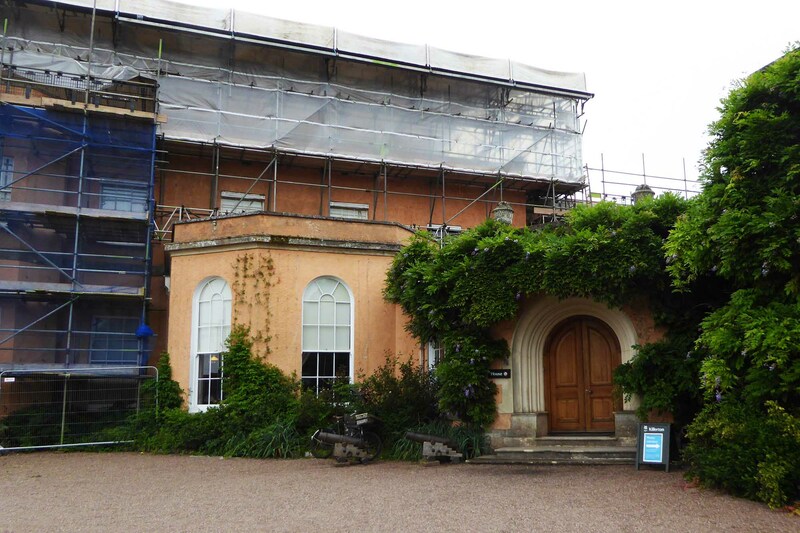 He believed in public land ownership and, in line with this, gave Killerton to the National Trust in 1944. During his long and varied career he co-founded the Campaign for Nuclear Disarmament in 1957, but rather surprisingly finished his working career as a maths teacher and college lecturer. Externally the 18th Century house was not much to see when we visited, as it was covered with scaffolding in order to repair the leaking roof. 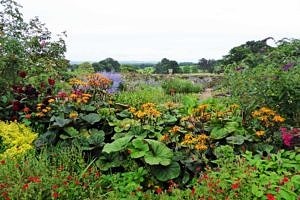 But this was more than made up for by the hillside garden, created in the 1770s by John Veitch, which provide a colourful foreground to sweeping views towards Exeter. Between rain showers, we managed a stroll in the woods which contain an international collection of rare and giant trees. This fine Elizabethan Renaissance house, dating back to 1598, is a prime example of an English stately home. The magnificent façade of the house is complimented well by the surrounding formal gardens and extensive parkland. The Long Gallery on the second floor of the house displays part of the National Portrait Gallery collection, although I must admit I can only take that many portraits before my attention starts to wane. Although there is much to admire at Montacute House, I think I will time a return visit for a less busy time of the year, when there are no queues to enter the house, and when you can admire the gardens and parkland in relative peace. 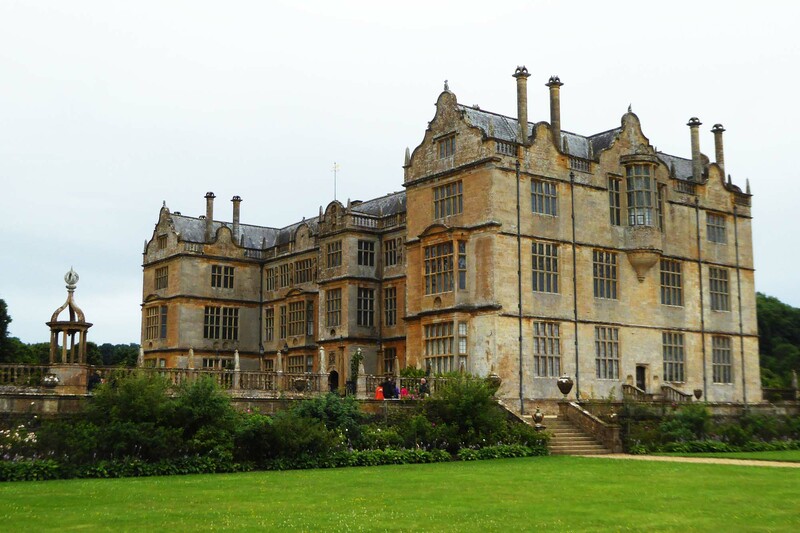 Tintinhull is only a few miles away from Montacute House, but is very different in concept. 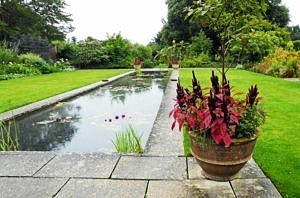 There is a small 17th Century Grade I listed house with two rooms on view, but it is the 20th Century Arts and Crafts garden that draws visitors. The garden is divided by clipped hedges and walls into several ‘rooms’, each with its own identity. We particularly enjoyed the Fountain Garden, Eagle Court and the Pool Garden. There were far fewer visitors here than at Montacute House. We enjoyed the tranquillity of this inspiring set of gardens amid the background sound of the fountain and rain drops falling in the pool when another shower ensued! Taking out annual membership of the National Trust and/or English Heritage can save you money if you intend to visit more than six sites a year. And, if you are a senior, then you can get discounted rates with English Heritage. If you are interested in membership of either of these organisations, then please read my article: English Heritage versus National Trust – Which to join?